Recent visitors at the Art Gallery of Ontario (AGO) might notice some unexpected advertisements in certain pieces' labels. The ads are for an app called ReBlink, and anyone who decides to download it and point their smartphone camera at certain artworks will be greeted by a hidden, twisted world where classic European and Canadian paintings take on a new light. That's because ReBlink, as imagined by Toronto-based digital artist Alex Mayhew, isn't the AGO's usual take on digital integration. 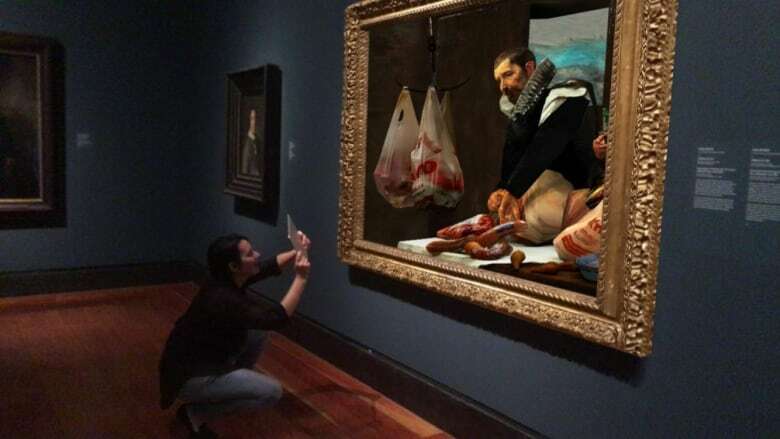 Instead, it's an augmented reality experience that uses paintings from the gallery's collection — including Cornelis de Vos's and Frans Snyders's Evisceration of a Roebuck with a Portrait of a Married Couple and George Agnew Reid's Drawing Lots — to show visitors what those classics might look like if they were created today. Keri Ryan, the AGO's acting head of public programming and learning, said that Mayhew came up with the idea after observing how museum visitors typically speed through galleries, without always stopping to appreciate the art itself. "We've actually done our own studies in the gallery that show people spend less than three seconds in front of an artwork," explained Ryan, in an interview with Spark. "That's where the magic of technology came in for us, because we realized that augmented reality might actually give us the tools to make something really special happen for our audiences that they weren't really getting by just reading a label or sort of gliding past the artwork." Simply put, ReBlink is just one example of the ways that traditional museums — including the AGO — are finding new ways to incorporate digital technology into their exhibits. Matthew Brower is an assistant professor in the teaching stream of the University of Toronto's museum studies program and the supervisor of the program's exhibition course. As he sees it, the use of tools like tablets, QR codes and augmented or virtual reality headsets within exhibits is just a modern way of catering to and attracting visitors. "In some cases, it's to provide alternative ways of accessing content," said Brower, in a phone interview with Spark. "It's about extending visitor engagement." Brower referenced the AGO's Small Wonders boxwood carvings exhibit as another example of a gallery using modern technology — specifically, virtual reality headsets — to give visitors a chance to learn more about the artifacts on display. "It [took] something very tiny that you could only see from a distance, because it's in a case and it's delicate, and [gave] you a different way of interacting with it, so you could appreciate precisely how complicated and densely carved it actually was," explained Brower. 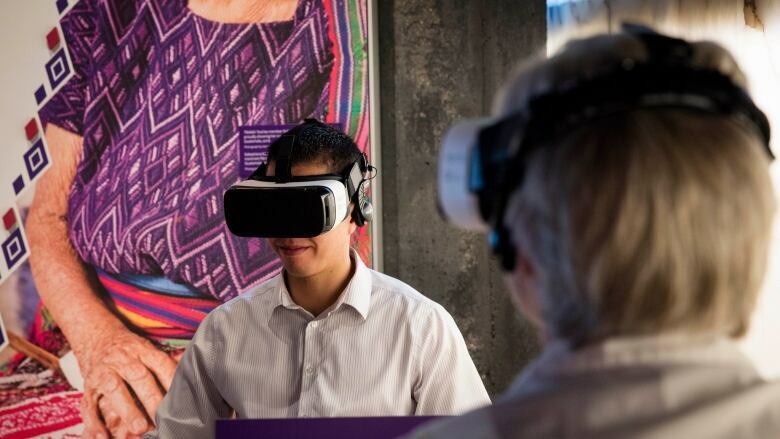 While the AGO and other similar galleries are finding new ways to integrate digital technology into new and existing exhibits, institutions like the Canadian Museum for Human Rights (CMHR) in Winnipeg have chosen to use technology as a primary point of exhibition. 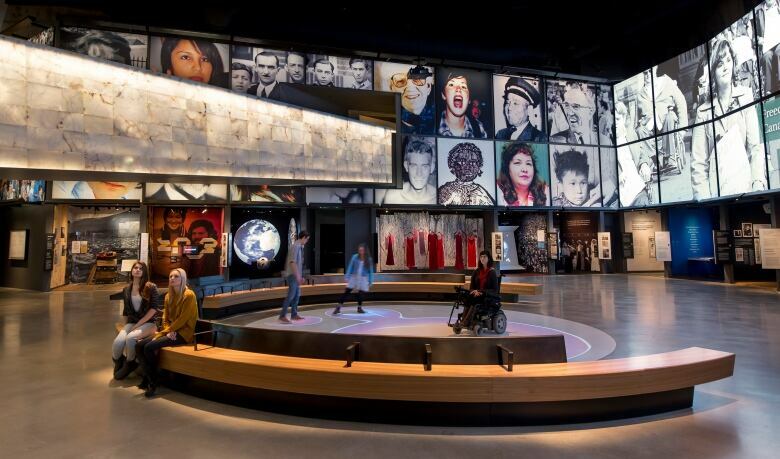 Scott Gillam, the manager of digital platforms at the CMHR, told Spark host Nora Young that his institution sees digital technology as a way to give visitors direct insight into the lives of those who fight for the rights of others. "It's really about how do we redefine the museum experience?" said Gillam. "How do we make it so that people can really connect with these stories in multiple ways?" Digital technology also allows institutions like the CMHR to be more inclusive toward individuals with varying levels of accessibility needs. For example, all videos and gallery items at the CMHR have American Sign Language and Quebec Sign Language translations. All text-based content can also be read aloud through voice-over readers, and the museum's visitors can even request free iPods to listen along to exhibits. "Basically, whether you're a student or whether you're someone who's never used technology before, we really see it as being a barrier-free entry," said Gillam. Of course, while the increased use of digital technology means that museums can connect with audiences in different, strategic ways, there are still concerns about the growing presence of screens in our lives. Kevin Von Appen, the director of science communications at the Ontario Science Centre (OSC), told Spark that it's often best to include new technology just for the sake of showing off emerging tools. Von Appen didn't pick on a specific exhibit, but he did say that he doesn't like it when institutions use videos or screens when a physical display could work better. "Sometimes, those things became default choices that we know didn't engage visitors the way they could have," said Von Appen, during a phone interview. Cara Krmpotich, an associate professor and director of the University of Toronto's museum studies program, said that it's also best to avoid replacing an object label with an iPad or tablet. "Often then people spend more time engaging with the content on the screen or their device rather than the things that are in the museum itself," said Krmpotich, in a phone interview. Due to these concerns, the AGO's Keri Ryan said she believes museums are still figuring out ways to appropriately integrate digital technology into physical exhibits. "Artists have been great at showing us the way, at sort of pointing to those magical moments," said Ryan. "They themselves can understand how technology can be used and stretched and imagined in different ways, and so I think the opportunities are there for lots of different types of experiences that we don't even know yet." Ryan also mentioned that visitors typically spend five to 10 minutes in galleries featuring ReBlink paintings — a notable increase from the three-seconds-per-piece the AGO previously calculated.